Disclaimer: I am not a doctor, nor do I have formal training in medicine. 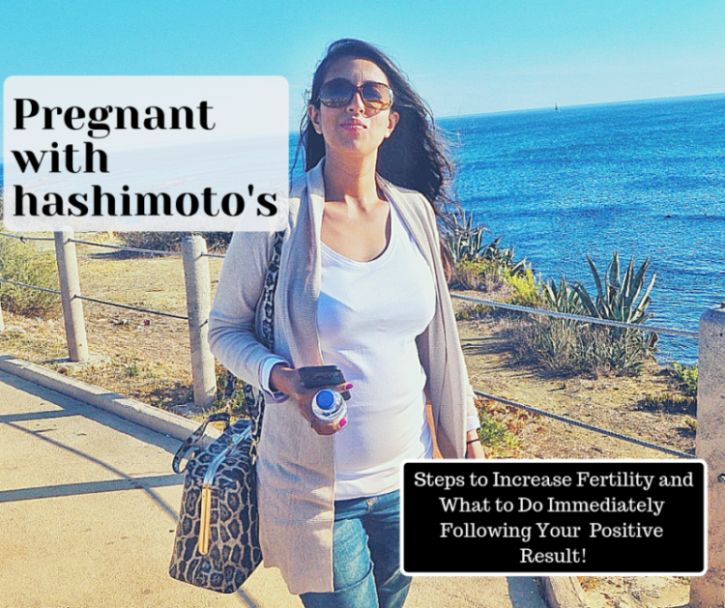 This is my personal experience with putting Hashimoto’s into remission and how to cure Hashimoto’s naturally after two years of research, consulting with numerous doctors (both conventional and integrative) and testing different treatments. I learned to question everything and be my own advocate. This article is not intended to be used as medical advice. Note: The doctor is not always right and certainly not always well informed. It’s time that we start questioning and holding them responsible. Remember when smoking was not considered harmful? Or when stress was never considered a factor in heart disease? Listen to your gut, pun intended, and be informed about your health. Links between immunity, gut health and diet are finally at the forefront but more research needs to be done. Many docs just aren’t up to date. Maybe these pics will help demonstrate the effects Hashimoto’s can have on you. I suffered from symptoms on and off for years. But it wasn’t until late 2014 that I could really start to see what was happening. 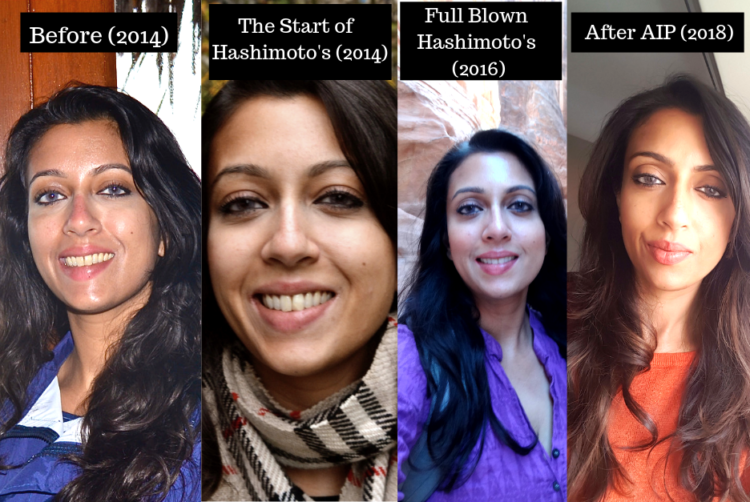 I was diagnosed in 2015 and by 2016, felt the effects of Hashimoto’s fully. I tried doing all sorts of things from the Whole30 program which helped a bit but wasn’t enough in the beginning, to attending the renowned FX Mayr Clinic in Austria. It was not until late summer of 2017 and early 2018 that I started working on how to cure Hashimoto’s naturally via the AutoImmune Protocol (AIP). Are you one of millions of people who know something’s wrong with their body but your doctor tells you everything is fine? Do you continue to gain weight even with a healthy diet and moderate exercise? Have you been told the answer to your fatigue and weight gain is to go to the gym and be more active? Or worse, been told to take an antidepressant?? Has your productivity or overall drive faded? You might have figured out that something is up with your thyroid but tests reveal your TSH level, the end all be all of thyroid function tests, is within normal range. I’m here to tell you that your thyroid is way more complex than just a TSH test. Your doctor should be testing you for several other levels, see below. I went to 4, yup 4 endocrinologists, who kept telling me everything was fine and that my ailments were all in my head. Complaints about fatigue and weight gain are the complaints of fat and lazy people, no one wants to hear it… not even your doc. It was my gynecologist who finally tested me for thyroid antibodies after I complained of symptoms for over a year. Blood tests revealed my body had developed thyroid antibodies well out of normal ranges. A few days later, a thyroid ultrasound showed two nodules and moderate tissue damage from the antibodies attacking my thyroid tissue. Even after the tests came back positive, three more endocrinologists said having antibodies is normal and that I should take a “wait and see” approach. Two docs offered me metformin, the drug for diabetic patients, even though I had normal blood sugar just to shut me up. High thyroid antibodies are not normal., especially when its the cause of healthy tissue being attacked! Why is that not common sense I wonder. A “ wait and see” approach is literally a guarantee to a path of thyroid destruction and life long cycle of medicines. In fact, its proof of an autoimmune disease called Hashimoto’s Thyroiditis where your body attacks itself. Eventually these antibodies will destroy your entire thyroid, leaving you with severe hypothyroidism and in need of thyroid replacement surgery. 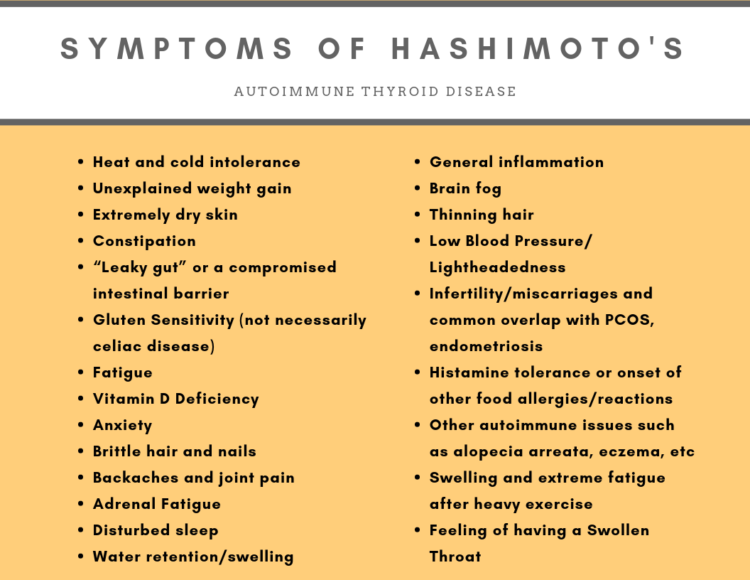 Hashimoto’s is the number one cause of hypothyroidism. Many don’t even know they have Hashimoto’s because it is their TSH alone that gets tested. Only those whose thyroids have been destroyed far along enough by the antibodies will start to see out of normal TSH ranges, finally indicating technical/clinical hypothyroidism to the medical world. Some docs will tell you that you don’t have Hashimoto’s unless your TSH is out of range. They know nothing. Leave their office immediately. Even what constitutes an appropriate TSH range is outdated in the endocrinology world. A TSH below 2.5 is normal. Some endocrinologists say below 4 is okay, others say 10! Why the disparity? It is because these doctors haven’t read the latest guidelines and literature. It’s negligent if you ask me. The only thing docs are taught in medical school about thyroid treatment is to prescribe synthetic hormone if your TSH is abnormal. That’s it. The standard treatment for high TSH is Levothyroxine or Synthroid, which may or may not alleviate the issue. More on that later. So why do so-called doctors not acknowledge thyroid antibodies? Because, as alluded to above, they have no idea how to treat your antibodies. It falls under the gray world of autoimmune disease, a mysterious and untreatable defect of the body (that would be sarcasm). To top it off, once your body develops one auto immune disease, you are at risk for developing several more auto immune diseases like rheumatoid arthritis, celiac disease, lupus, Crohn’s disease aka inflammatory bowel disease, alopecia arreata, psoriasis, eczema and more. These diseases are all the result of the same mechanism, inflammation as well as antibodies attacking healthy tissue but just in different parts of your body. It’s not all doom and gloom. Autoimmune diseases are very treatable and can go into remission. Mine did. One of the major keys is to eliminate inflammation as much as possible. The other is to find out why it’s happening in the first place. Many are symptomatic way before their TSH starts to show out of range. My TSH never actually went above 3.2. This was my experience. My body was shutting down. I was tired all the time and put on 15 lbs in a 3 month span. My face and hands were habitually puffy. I didn’t recognize myself in pictures or in the mirror anymore. My skin was dry no matter what I did. I could feel my thyroid swollen and pulsing at different times. My fingernails started forming ridged lines… a telltale sign that your thyroid is really starting to diminish, although destruction can start years prior. I became sensitive to light, would feel cold at the drop of a hat, developed weird food allergies in my mid 30s, became disinterested in people and couldn’t sleep through the night. I even got shingles, another surefire sign that your immunity is low. I tested positive for inflammatory markers. Still every endocrinologist I saw did nothing. It didn’t help that I was on a plane every month, disrupting what should have been me practicing normal sleeping and eating patterns. What is TSH and thyroid hormone all about anyway? TSH, thyroid-stimulating hormone, is a pituitary hormone that fluctuates depending on how much circulating thyroid hormone there is in your body. It tells your pituitary gland how much Thyroxine, aka T4, to produce. Your body then converts T4 to T3, the usable form of thyroid hormone. T3 is used for so many things in your body from body temperature regulation to metabolism to heart rate and much more. Elevated TSH usually indicates hypothyroidism. It is possible to reverse the road to hypothyroidism if you catch Hashimoto’s in its’ early enough stages. Lab tests show elevated TSH in people who have advanced Hashimoto’s or primary hypothyroidism. However, TSH can fluctuate so it’s not always an adequate measure. The other issue is that TSH will be normal for many until they reach an advanced stage of tissue destruction, as was the case with me, and so many others who go untreated until the damage is extensive. So that is why you must test for other indicators. Back to Levothyroxine and Synthroid. These are widely prescribed synthetic T4 drugs. The issue with both is that if you have a conversion problem to T3, these drugs won’t work! Many people have T4 > T3 conversion issues. In fact, the drugs increase something called Reverse T3, aka RT3 , for those with conversion issues… making symptoms even worse! The other issue is that these pharmaceuticals contain fillers like soy or cornstarch, which tend to aggravate inflammation or even worse for people with allergies to these ingredients. Let’s get into what your doctor should test for. Many endocrinologists, especially in the U.S., will not order these tests for you. Why? They think its irrelevant plus insurance may not cover it. They’ll have to explain to their hospital administration why they are ordering tests outside of normal protocol. You have three options. 1) Demand it from your doctor. If they still don’t budge, ask them to document in your file that they refuse to order these tests. That should help. 2) Find an integrative or functional doctor who generally are much more aware of thyroid function, hormone production and how nutrition relates to all of it or 3) order them yourself from a private lab. Send me a message if you want a list of private labs that do this. The most useful tests for diagnosing Hashimoto’s Thyroiditis are thyroid antibody tests and thyroid ultrasounds. I know this is going to sound counter intuitive but a small percentage of people have Hashimoto’s without elevated antibodies to reflect it. That is why you need to have a thyroid ultrasound in conjunction with the tests, especially if you’re symptomatic. It also will alert you to any thyroid nodules that are present and how far along tissue damage is. I won’t quote specific numbers because every lab has their own ranges for these tests. Make sure you fall within range, especially for the antibody tests. As for T4 and T3, make sure you test Free T4 and Free T3 as opposed to Total T4 and Total T3 as the latter don’t reflect how your body is utilizing the hormone. They bind to other proteins, which may paint an inflated picture of how much there is for your body to use. There are a number of causes. You might check off more than one on the list. I checked off four or five. The jury is still out on whether some of the items listed below are causes or byproducts of Hashimoto’s such as gluten sensitivity, Vitamin D deficiency and intestinal permeability. Now let’s get to the healing part! The products shown below are products I use everyday, have paid for myself and highly recommend. None were given to me as part of any promotion. As an Amazon Associate I may earn from qualifying purchases you make. Again, I am not a doc but here is exactly what I did to bring my Hashimoto’s into remission. I’m going to repeat that it is very important to get a thyroid ultrasound in order to assess how far along thyroid tissue damage is. If it is more than moderate damage, doing the following steps will help to a degree but you may need thyroid hormone to supplement these steps. 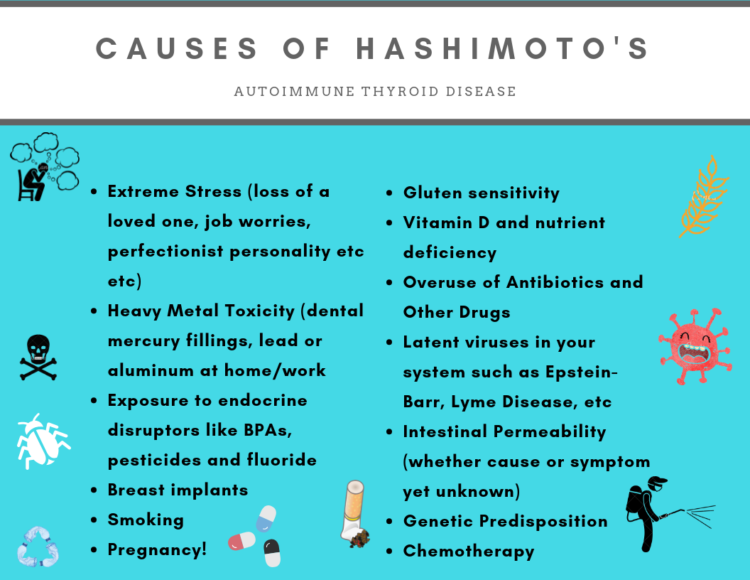 The other disclaimer I’m going to write is that Hashimoto’s is a result of years of system abuse whether from stress, diet and/or environment. You must reset your body with a clean diet and a healthy environment regardless if the initial cause was poor diet or not. Popping prescribed medication is not always the answer. Many people have trouble comprehending that what you put into and on your body has a tremendous effect on immunity and overall health. People are emotionally tied to their food and have been brainwashed for years that certain consumables are harmless and may actually be good for them. Since you probably don’t know which food or combination of foods is contributing to your symptoms, an elimination diet is absolutely necessary. Even eliminating foods that are otherwise healthy is necessary since certain components of them are leaking out from your gut and into your bloodstream, prompting autoimmune attacks. I found relief after doing the AutoImmune Protocol (AIP) for two months. Some people need 6 months on it. It all depends on your body. The diet eliminates gluten, dairy, soy, alcohol, caffeine, grains even wheat, rice and lentils, the nightshade family (which is actually a huge trigger for many surprisingly), nuts, eggs, shellfish, fried and/or processed foods and excess sugar. Even more than a handful of fruit in a day is not recommended. I can’t stress how important eliminating gluten is. Via something called molecular mimicry, Gluten, as it leaks through the open barriers in your gut, can initiate an autoimmune attack on your thyroid since the protein portion of gluten, called gliadin, closely resembles thyroid tissue. With Hashimoto’s, your body is attacking healthy thyroid tissue. So, even if you are not someone whose ever suffered from celiac disease, you must eliminate gluten if you have Hashimoto”s. Also, wheat is processed so weirdly these days and sprayed with pesticides that it’s not good for you. Soy is another big one. The soy in our food is not the same soy that exists in Japan. All soy in the United States is GMO soy. There is a big difference between fermented and unfermented soy. Avoid it at all costs. It may be in your food, your supplements, sauces etc. It’s completely toxic for your thyroid. AIP is much more comprehensive than a regular Paleo diet or even Whole30. I know, it sounds tough but it is doable. Small steps. The AutoImmune Protocol is not really meant to be long term but some prefer to stick with it. You’ll feel so much better that you won’t even miss those foods that much. It just won’t be worth the trouble of feeling sick and tired. As your gut heals, you can work back in some things… probably not gluten and dairy. Some items that are recommended on AIP may still bother you. I had histamine intolerance alongside my Hashimoto’s so I couldn’t tolerate fermented foods like bone broth, sauerkraut, kimchi like foods. Anything that was acetic or had vinegar was also a big no for me. You’ll start knowing your body and what does and doesn’t work. The other important thing to note with AIP is that it is not like the Atkins diet or Paleo, where you have a green light to consume a 300 gram (more than half a pound) of meat in one sitting. Meat should take up a small portion of your plate, fresh vegetables the majority and a very small amount of unrefined starch. True, proteins from meat aide in healing and rebuilding but quantity and quality must be observed. The meat should be organic, free range AND hormone free. Ingesting meat from diseased and caged animals injected with hormones and antibiotics leads to inflammation in your body. Same for farmed fish. I don’t eat it. AND same principle for cow’s milk and why dairy is such an issue. Here are some suggestions. Instead of soy sauce, which is not allowed on the AutoImmune Protocol, use this yummy soy free substitute. Or try this compliant coconut milk for amazing thai dishes and curries. Need a substitute for peanut butter? Use this nut free substitute instead. Looking for a gluten free flour to thicken sauces and soups? Arrow root flour is the answer. There’s plenty of choice out there. Get motivated. Many docs will tell you… you just need to do more exercise. No. For people with Hashimoto’s, intense exercise may be really bad. It can cause swelling and a lot of water retention. The reason intense workouts might not be the answer is because many people with Hashimoto’s suffer from adrenal fatigue. Your cortisol production is unbalanced and your body needs rest when you have adrenal fatigue. Sure, daily walks are fine and light weights for 10-20 minutes, 2-3 times a week is okay. But I don’t suggest any more than that. I made the mistake of partaking in heavy exercise before my wedding in 2016. I was so bloated, you can clearly see the inflammation on my face in the photos. And for years before that, I never understood why it took me three days to recover from a good run. In mid 2017 when I finally started AIP, I waited 4 months before I even went to the gym. Just lots of sleep, low stress and a very clean diet. I could feel the transformation. I started hitting the gym in January of ’18. Over the course of two to three months, I took off 12lbs that had been plaguing me plus a whole lot of inflammation. It looked like I had lost 20lbs. Note: If you are one of those people who must use thyroid hormone to supplement via Natural Desiccated Thyroid, proper adrenal function is one of the keys to the hormone working. If your iron or cortisol is lacking, NDT will not work well for you. No bottled water, no plastic food storage, no foods wrapped in plastic at the market, no non stick pans. Plastic and teflon are severe endocrine disruptors. My husband couldn’t understand why I threw out all our plastic containers and non stick pans at first but it is necessary. I only use glass storage containers. My preferred cooking pans are those made from cast iron. Even aluminum pans and foil can leech metal into your food at high temperatures contributing to heavy metal toxicity. Teflon contains fluoride, another endocrine disruptor. This is also why you should only drink non-fluoridated water and use non-fluoridated toothpaste. A good water filter can easily remove fluoride and you can find toothpaste with no fluoride in many places these days or from Amazon. The Berkey water filter system is the best system on the market to remove fluoride and heavy metals. P.S. Toss the microwave!. I haven’t used a microwave in about 6 years. I knew it was terrible for me even before my Hashimoto’s diagnosis evolved. If you have Hashimoto’s, you most likely have a permeable gut. It it is unclear which comes first, intestinal permeability or autoimmune disease but they are highly correlated. Even if you consume a healthy diet when you have an autoimmune disease, your body is not absorbing the nutrients it needs… because its literally leaking out of your intestines. Hence the term leaky gut. You need to supplement. And all supplements are not created equal. I will write another post on this. But you should absolutely check that the supplements are gluten, dairy and soy free. Many have fillers, which can make you feel worse. Probiotics should have at least a billion strains, most require refrigeration. Look into delivery methods and see if the transporter ships with an ice pack. The most important supplements for me were Vitamin D3, magnesium, B complex vitamins, Selenium and Zinc. I also took a high quality probiotic for two months. I felt the difference immediately after the supplements. You’ll want methylated forms of your B Vitamins as some people don’t process them due to a genetic factor that many of us with Hashimoto’s have… called an MTHFR gene mutation. It is important that you take these supplements at the right times of day with either water or food as recommended or in tandem with another vitamin for absorption. If you are taking thyroid hormone, space your supplement consumption at least 2 hours away especially from iron, calcium and magnesium. Vitamin D deficiency is inextricably linked with autoimmune disease, even some cancers and a host of other issues. My level was at 16 when I was diagnosed. I got it to 80 after five months by taking 8,000 units of D3 drops everyday. Get your levels checked! Magnesium and B vitamin blood tests can be misleading. It’s complex biochemistry that I won’t get into right now. The point is you may still need to take supplements for them even if your tests come back in range. You’ll probably read about people using a whole host of other supplements like glucosamine, LDN, iron, etc etc. I’ve listed the essential ones that I think every person with Hashimoto’s should take. You can later determine what to add. Medications blow holes in your gut leading to intestinal permeability. It also lowers the amount of crucial good gut bacteria necessary to maintain healthy function in your body. I was stuffed with antibiotics as a kid since my pediatrician would give me a round of antibiotics several times a winter every time I got a hefty cold. This happened for years and honestly, I can’t imagine what the effects to my body were. Ibuprofen does the same thing. I lived on Advil in my 20s for both menstrual pain and hangovers. I use natural remedies now if I get sick, which is rare. Instead of antibiotics, I take a teaspoon of Oil of Oregano diluted in water or a few drops mixed with olive oil, follow the instructions on yours as it is potent. It will rid your body of anything bacterial. Organic herbs like thyme, basil, oregano, ginger root, holy basil and curcumin and items like manuka honey and milk thistle will keep you healthy. I didn’t believe all the natural mumbo jumbo in the beginning. I was highly skeptical. But after using them myself, I confirm that they worked for me. The remedies listed don’t compromise your good gut bacteria either. Remember, immunity lies within the gut. Note: Herbs and natural remedies can be more powerful than you think. Check with a trusted resource before taking if you are pregnant. Some herbs may have natural abortive effects or stimulate pre labor. You have to drink a good amount of water everyday. I do 2 liters in cold weather, more in warm weather. It’s the best way to flush your system and keep things moving. Warm/hot liquids are even better, I don’t mean coffee or caffeinated tea. It aides digestion, kills bacteria and helps with constipation. Cold liquids and foods can actually inhibit bowel movements. I drink hot water with gluten free, low sodium broth cubes throughout the day or a detox, non caffeinated tea like chamomile with lavender or fennel with ginger. Bone broth is highly recommended for people doing AIP or who have Hashimoto’s. I found it a pain to make between sourcing the right bones and it taking 18-24 hours on the stove etc. It also didn’t have the same therapeutic affects for me but many people swear by it in the groups and forums I’m part of. Companies sell and deliver it too, especially in the U.S., so you can avoid the hassle of long hours at the stove. Whether its bullion cubes, teas or bone broth… start incorporating hot liquids into your daily routine. I can’t tell you how important this one is. I made it a mission to get at least 8 hours of sleep. The regenerative effects of good sleep are unmatched. You feel better, you think better and you eat better when you’re well rested. Sleep also affects cortisol production, which has a big impact on your adrenal health. As for stress, you know what causes you stress so I’ll let you figure it out. But sometimes you just have to say goodbye to people and situations that cause you stress. I did. A lot of it is also about controlling your thoughts, reactions and perspective. Negative or perfectionist thinking is just as toxic as external stress. Yes, I’m talking to you judgy people. Quiet time, yoga and meditation can help a lot. I also breathed in lavender essential oil or put a couple of drops on my pillow at bedtime whenever I felt stressed. Again, quality essential oil is paramount. Iodine can help a ton for people with hypothyroidism but it’s not for people with Hashimoto’s. There is a difference. Not all people with hypothyroidism have autoimmune issues. Iodine, as well as ashgawanda (an adaptogenic herb) can actually stimulate immune responses. Some will tell you they are necessary, others will say stay away. I did not go near either. I also avoided green tea. Not everything deemed “healthy” is good for you when you have Hashimoto’s. As I said above, I never went near table salt again due to iodine content. Good quality pink salt regulates blood pressure and is overall better for you. Pink Himalayan salt also plays a key in helping to restore adrenal health. Drink a glass of warm water with pink himalayan salt, a bit of citrus and a teaspoon of cream of tartar in the morning. Adrenal fatigue is common for people with Hashimoto’s and is necessary to overcome in order to fully heal. Thyroid medications don’t work well if your cortisol production is off. Get vertigo or feel dizzy?? have anxiety? crave salt? It might be your adrenals, which are taxed. Get a saliva test to confirm. Blood tests are not so accurate. Believe it or not, there are endocrine disruptors in pretty much every product we use for our hair and body unless explicitly mentioned. Even perfumes can have a profound effect on well-being. Scented candles, body sprays, skin creams etc etc should be avoided. Nail polish should be formaldehyde free. And your deodorant absolutely aluminum free. Clogged breast ducts leading to breast cancer from the use of anti perspirants with heavy metals is not a new phenomenon. I threw all of this stuff out. Not to mention, I save a ton of money now by not buying them. My skin has never been better. All my moisturizers are gluten free and natural. The shampoos I use are paraben, phalate and sulfate free. The same goes for soaps. Castile soap is wonderful. These are the best products I’ve used for soap, lotion, shampoo, general beauty needs, fluoride free toothpaste and aluminum free deodorant. I use them everyday. If all of this seems really drastic, maybe it is. But so is your body attacking its own tissue. That is drastic and not okay. I would suggest doing everything in steps. I started with the AutoImmune Protocol (AIP) and getting the right supplements at first and then moved on. The first week I gave up gluten, the second week I gave up dairy, third was coffee and alcohol (that was a tough week) and so on. I was then strict for another month and maintained the full elimination, not even eggs. The following month I looked into eliminating plastics, soaps, shampoo and household cleaners that contained a large portion of unnatural ingredients. I can’t tell you how well vinegar, tea tree oil and eco-friendly products clean your home and clothes. The next month, I got a great water filter and cast iron pans. It took about three or four months, but it all became second nature and my new norm. It honestly wasn’t that difficult. Now, I have a lot of my favorite things again in moderation… eggs, wine, chocolate, coffee but again no gluten and very limited dairy. My antibody tests are in range and I feel like I have all my energy back. See what works for you. You might find that dairy and alcohol are an absolute no, but nightshades (peppers, potatoes, tomatoes and eggplant) are okay. I don’t handle nightshades well by the way. Everyone’s body is different. I promise you that you’ll be extremely in tune with your body after this process. You’ll know immediately when something doesn’t suit you. It’ll pop up in the form of a headache, swollen ankles or maybe joint paint. Maybe you won’t be able to poo. In the end, you’ll be better informed and hopefully healthier, like me. 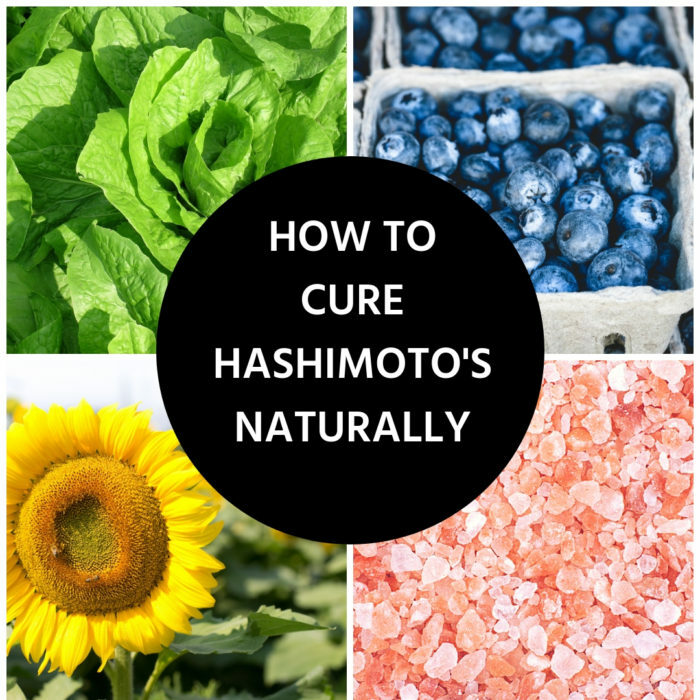 Have questions on how I chose to cure Hashimoto’s naturally or anything else? Ask me in the comments below.